Hire A Better Pest Control Service! Everything to know about Bed Bugs! would you like a free inspection ? 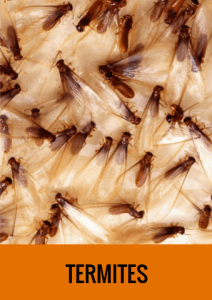 WHAT ARE TERMITES AND TERMITE PEST CONTROL SERVICE? Termites are social insects that live in large colonies where populations can reach more than one million. A colony consists of several structurally differentiated termite forms living together as castes (including reproductives, soldiers, and workers) with different functions in community life. In the spring, winged reproductives leave the parental nest in swarms to create a new colony. The swarming lasts less than an hour, so it’s very likely you’ll never even see it. The winged reproductives themselves look quite a bit like flying ants, for which they are often mistaken. The Eastern subterranean termite is the most common and most widely distributed termite in North America. This native American pest feeds on such cellulose materials as structural wood, wood fixtures, paper, books, and cotton. Occasionally, it will even attack the roots of shrubs and trees. A mature colony of Eastern subterranean termites can range from a low of 20,000 to a high of 5 million workers, with an average of 300,000. The colony’s queen will add 5,000 to 10,000 eggs per year to the total. While Eastern subterranean termite colonies are not the largest termite colonies you can find, there will often be more than one colony working in a single building. 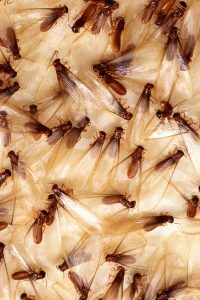 Signs of Eastern subterranean termites include dirt-colored tubes built to serve as protected paths from the earth to the wood the termites are feeding on, and the translucent wings shed by the kings and queens during swarming. Swarming usually occurs in the spring, but other, smaller swarms can occur throughout the summer and fall. An average Eastern subterranean termite colony can consume 5 grams of wood per day, the equivalent of 2⅓ linear feet of a 2′ x 4′ pine board annually. Colony growth is slow, and it may take years before swarmers are produced. Eastern subterranean termites can enter buildings through cracks less than 1/16 of an inch wide. The termite colony is made up of different types (castes) of termites—each with separate work responsibilities. Although Eastern subterranean termite colonies are largely located in the ground below the frost line, secondary colonies can exist above ground, and examples of true above ground colonies existing without any ground contact have been seen. However, such above ground colonies have access to moisture and often the source is a roof or plumbing leak. Eastern subterranean termites will often build mud tubes for travel between their colonies and their food sources. The king and queen in a colony can live for 10 to 30 years, while workers live for about two years. Use a product that works without question, uses the latest technology available, and is formulated with your family and the environment in mind. Personalize the service based on your needs and is applied by experienced, knowledgeable professionals that are QualityPro Certified. Be a termite control company that cares and stands behind both the product and service they provide. You could spend a great deal of time looking for a termite control service that meets all of these criteria. Or, you could look to the one that has already proven to be the best; Bug Busters. Termites cause over $6 billion of damage annually in the U.S. alone. Having a pest professional protect your home with Termidor® termiticide/insecticide is the best way to rest assured it won’t become a part of that statistic. Like many other termite control products, Termidor is applied as a liquid, but that’s where the similarites end. Many older liquid termite products are repellents, which termintes can not only detect, but also take great pains to stay away from and circumvent. In fact, given the tiny entry gaps that termites are able to fit through, ti si virtually impossible to maintain a secure chemical repellent barrier around your home. Since Termidor is undetectable, termites neither avoid its treatment zone, nor try and find a way around it. Being #1 inevitably draws claims of “similar” results. But even other nonrepellent liquids can’t match the unprecedented performance or success rate of Termidor. Other products claim to be “nearly”, practicalllly”, or “almost” as effective, but the difference between “almost as good as Termidor” and Termidor itself, can make all the difference in the world when it comes to ensuring your home is termite free. Are you will to bet your home on “almost as good”? Termidor features the most effective termite-control technology and application methods available today. At the same time, it has a long history of proven success, like Bug Busters. For more than a decade, Bug Busters has been using Termidor to successfully treat and protect thousands of homes in Virginia. Our Termite Control Program begins with a Free Inspection. This detailed inspection will help determine whether or not you have an issue with termites at your property. Prevention is the key to keeping your home safe, so even if we don’t find any signs at the time of your inspection, we will always due you justice by offering our Termite Control Program. In the case where termite evidence if found, we will outline our plan to eliminate and prevent future infestation. Termites cause more damage in VA each year than fires and natural disasters combined. Insurance companies do not cover termite damage. You are responsible to protect home. Bug Busters has proven time after time to be the best at pest control, for residents and businesses. Request a free inspection. Bug Busters is the sister company of Dry Seal Home and Basement Solutions. Together we keep homes and their owners safe! Welcome to www.mybugbusters.com, home of the the top growing pest control company in Virginia since 2004, serving customers for any pest control, extermination, or wildlife trapping need in Amelia VA, Amherst County VA, Appomattox VA, Ashland VA, Altavista VA, Beaverdam VA, Blacksburg VA, Blackstone VA, Bon Air VA, Brookneal VA, Buckingham VA, Campbell County VA, Cave Spring VA, Charlotte County VA, Charlottesville VA, Chesterfield VA, Colonial Heights VA, Crewe VA, Doswell VA, Farmville, VA, Gladstone VA, Gloucester VA, Goochland VA, Hanover VA, Henrico VA, Hollins VA, Keysville VA, Lunenburg County VA, Lynchburg VA, Madison Heights VA, Mechanicsville VA, Mecklenburg County VA, Midlothian VA, New Kent VA, Orange VA, Petersburg VA, Powhatan VA, Prince George County VA, Richmond VA, Roanoke VA, Salem VA, Timberlake VA, Varina VA, Virginia Beach VA, and other surrounding areas located in central/ south eastern VA.